Monday 12th March 2018 - Toshiba's Client Solutions Division (CSD) a division of Toshiba America Information Systems, Inc., today announced the first completely wearable Augmented Reality (AR) solution to combine the power of a Windows 10 Pro PC with the robust feature set of industrial-grade smart glasses. Designed for enterprise customers, Toshiba's new dynaEdgeTM AR Smart Glasses packages together the company's new dynaEdge AR100 Head Mounted Display (HMD) with its dynaEdge DE-100 Mobile Mini PC for a completely wearable PC system maximizing mobility, productivity and security without compromising flexibility. Toshiba's new AR solution provides Document Viewing, Live Video Calls, See-What-I-See, Photo/Video Capture, Alerts/Messaging, Workflow Instruction and Barcode Scanning capabilities making it ideal for a variety of uses cases, including Maintenance, Remote Expert, Manufacturing, QA Inspection & Audit, Logistics, Training and Knowledge Transfer. Available in the second quarter with a starting MSRP of $1,899.99, the dynaEdge AR Smart Glasses is offered in various configurations with processor, memory and storage options as well as developer's kits for different industrial applications. "For decades, Toshiba has been instrumental in streamlining the operations of businesses around the world through cutting-edge, mobile computing technologies. Much like how laptops have increased office productivity by enabling workers to take their PCs with them anywhere they go, we believe that wearable PCs combined with smart glasses will take on-the-job productivity to a whole new dimension," said Carl Pinto, vice president, marketing and engineering, Client Solutions Division, Toshiba America Information Systems, Inc. "We developed the dynaEdge AR Smart Glasses to help businesses mobilize their frontline and field workers and improve business outcomes with powerful PC solutions that can go anywhere they go without being obstructive. For the first time, a Windows-based PC can be worn to provide augmented reality for the job site, and operated using voice and touch HMD technologies, keeping hands free for hands-on work." Weighing in at less than two ounces, the wearable Toshiba AR100 Head Mounted Display is extremely lightweight and used with either the left or right eye based on user preference. It features an integrated micro display that provides a viewing experience equivalent to a 4.1-inch display seen at 14 inches. The HMD has an integrated touchpad, GPS, three-axis accelerometer with a gyroscope for head tracking, 5MP POV camera, speaker and dual noise-canceling microphones that are ideal for voice communications. To enhance the overall functionality of the dynaEdge AR Smart Glasses, Toshiba offers a variety of mounting options to create a solution that can truly operate in any work environment. Options such as Lens-less Frame, Safety Frame, Safety Helmet Mounts and Headband deliver the flexibility and comfort demanded by enterprises deploying wearable solutions. The AR100 HMD was developed in a partnership with Vuzix Corporation. "We are excited to partner with a world-class organization like Toshiba to bring to market together the first Windows-based smart glasses solution. We look forward to a long-term collaboration between the companies on this and future programs," said Paul Travers, President and Chief Executive Officer at Vuzix. Measuring 6.5 x 3.3 x 0.8 inches thin and weighing less than 11 ounces, Toshiba's wearable dynaEdge DE-100 Mobile Mini PC features a five-button, on-device navigation system to enable up/down, left/right toggles as well as an enter button. By combining that with the swipe and tap functionality afforded by the integrated touch pad on the dynaEdge AR100 Head Mounted Display, users can easily navigate, find, open and operate applications seamlessly without needing a traditional keyboard and mouse. Toshiba also included a finger print sensor for quick and secure access to the dynaEdge AR Smart Glasses. To support around the clock operations, Toshiba engineered the dynaEdge DE-100 with a removable battery and offers an optional external battery charger that charges four batteries simultaneously. 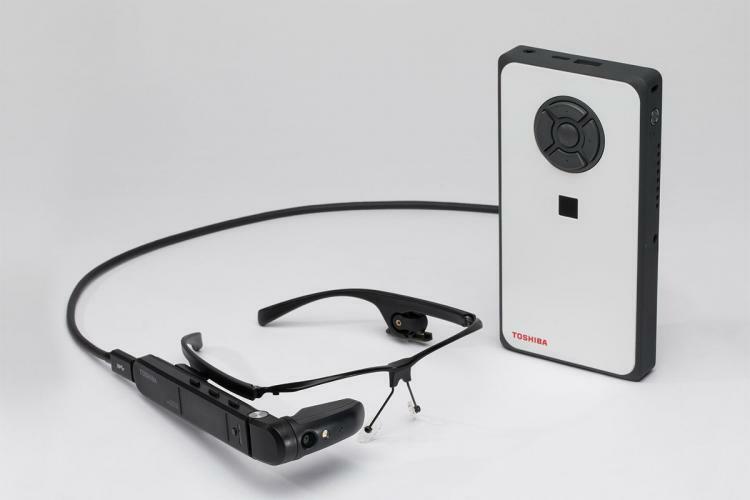 As Toshiba's first enterprise-grade mobile wearable AR solution running Windows 10 Pro, the dynaEdge AR Smart Glasses seamlessly integrates into an organization's existing infrastructure and IT security. "We are thrilled that Toshiba is building innovative intelligent edge solutions that take advantage of the power and security of Windows 10 Pro," said Peter Han, Vice President, Partner Devices and Solutions, Microsoft. "The DynaEdge AR Smart Glasses is a unique mobile solution that empowers industrial workers by providing the flexibility and security they need to be productive whether they're in the office or out on a job site." Toshiba developed its dynaEdge AR Smart Glasses solutions to meet the performance demands of enterprise workplaces through the adoption of 6thGeneration Intel Core M Processors, Intel HD Graphics and Intel Dual Band Wireless-AC 8260 802.11ac Wi-Fi. These technologies differentiate the Toshiba AR solution regarding performance, security and connectivity from the competition. "Technology has created a new world of work empowering employees to have unprecedented performance-enabling access to information based on their mobile workstyles," said Tom Garrison, vice president and general manager of the Desktop, Commercial and Channel group at Intel Corporation. "Mobile edge devices powered by the Intel Core vPro processor bring more innovation to employees and IT by delivering the performance for maximum productivity, enhanced security and remote manageability for IT. It also enables new possibilities including the application of artificial intelligence to frontline workers." The solution includes a protective ballistic nylon holster for the dynaEdge mobile mini PC, which offers excellent comfort for hours of fatigue-free use in the field, and a rugged storage case to protect the entire system when not in use. When not in the field, users can simply disconnect the smart glasses and use the dynaEdge PC as a traditional Windows 10 Pro desktop by connecting it to a traditional PC display. To complete the dynaEdge AR Smart Glasses solution, Toshiba will offer customers two software options-Toshiba Vision DE Suite and Atheer AiRTM Enterprise. Toshiba Vision DE Suite is the software engine designed to realize the essential functionality of Toshiba's innovative AR solution. For fast and easy navigation, device functions are grouped into three color-coded menu categories: Communications, File Viewer and Tools. From these three menus users can take photos, record and stream live video, save and retrieve documents, access diagrams, receive text messages and communicate through live video calls. This easy-to-use approach to navigating a robust solution elevates productivity and improves efficiency. In addition to a full suite of on-device services, the software offers IT manager and organizations with advanced synchronization and centralized device management capabilities. Toshiba Vision DE Suite reimagines productivity and efficiency for enterprises. Developed by Atheer, Inc., the Atheer AiR Enterprise software is an enterprise-class Augmented Reality application bringing remote subject matter calling, access to contextual documentation and resources, checklists and step by step task flows (with touchless, gesture-based interaction), and barcode scanning to Toshiba's dynaEdge AR Smart Glasses. The Atheer AiR Enterprise software is designed to improve worker productivity, reduced downtime, enhance accuracy and quality as well as improve worker safety. "We are excited to be part of Toshiba's initial software offering," said Soulaiman Itani, CEO and co-founder of Atheer. "We believe the combination of Atheer AiR Enterprise and the dynaEdge AR Smart Glasses provides a solution that will help enterprises significantly enhance the productivity and effectiveness of their workforces." The dynaEdge AR Smart Glasses and a complete line of accessories will be available in the second quarter of 2018.